If you are a regular air traveler, you must know that the delays at airport are even longer these days. Most of the airlines realize the value of the time and hence they provide excellent lounge facilities for first class and business class passengers. 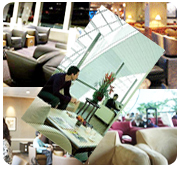 The lounges are places where the passengers are given options for eating, drinking, working and moreover relaxing. Some of the posh lounges even have spas, gyms, showers and even babysitting places out there.Here are the best five airport lounges where you would surely want to hop around. This is the largest lounge in San Francisco’s circa-2000 international terminal. This business class abode has large cubicles as workspace, a marvelous runway view for people for passing their time and a hosted bar good for two free drinks. There would a limited choice of food offering too. The first class lounge is in downstairs which is small, quiet and gracious decorated with art pieces. The timings at Red carpet club would be 8 a.m. till 10:30 p.m. It is located in the international terminal, just past security, up one floor. The lounge is luxuriously offered with comfortable seating, big-screen TVs tuned to news and sports, some basic hot and cold snacks and a good bar. For business class passengers the lounge is generously separated into work spaces and quiet places to relax; plus half a dozen private shower rooms. If you want to pass your time before those early morning/late night flights, the lounge would be the excellent choice. It would be opened from 4:30 a.m. till 11:30 pm and is located in the main terminal alongside the concourse D, across from gate D30 and up one floor. The lounge has been opened in January and has been said that the Lufthansa has spend nearly $10 million for upgrading and enlarging the lounge. It has three lounges; first class lounge for the highest level frequent flier which has a dining room and shower facilities. This is located on the third level. Next comes the Senator lounge which is located on the second level with parquet floors, showers and a bar stocked with German beers and wines. For business class passengers the lounge is in the main level. It is larger than the Senator lounge and it has a cinema-style theater with four LCD televisions and 18 seats. The lounge is located in Terminal1 and is directly behind security. This 43,000-square-foot, wood-and-granite lounge has an open air facility overlooking the terminal. The bar is named as Long bar which is stretched out over 80 foot and there are four restaurants for dining. The first class passengers have exclusive restaurant called Haven and a Japanese noodle bar. The spa is a complete luxury with private cabanas, complete with personal showers, beds and oversized tubs. The llounge is also a free Wi-Fi zone that helps business class travelers to spend their valuable time doing work. Elegance is the word that describes this lounge and this shows what money can buy. The first class lounge is provided with a wine cellar, spa, buffet and juice bars, kids' play area and free Wi-Fi. While the business class lounge has a spa, showers, two business centers, PCs and a conference room. The lounge also offers gourmet selection of hot and cold delicacies from around the world along with fresh drinks, soft drinks, wines and beverages. The whole ambience is soothing and enjoyable. The lounge is located in terminal 3.